Forcing a smile, I walked away into the wings and got out my phone. I’d never been a fan of forensics shows on TV, but I had a vague idea that the longer you left things at a crime scene, the more evidence was destroyed or contaminated. If I got the police in quickly enough, maybe they could find out who I’d been listening to before anything drastic happened. To an onlooker, it might seem that Lorna Powell has it all. She lives with her brother and his friends, who make up the super popular band Turmoil. Money is no object, so she has a hot new car, and travels the world. But it’s not all as good as it seems. Lorna craves time alone, away from the craziness of living with four rockstars, and friends her own age. So when they buy a house back in Australia and Lorna starts school, she hopes things are going to change. But when she uncovers a plot to blow up the band, Lorna’s life seems to be changing just a bit too much. Suddenly she’s an undercover detective, trying to work out who’s got it in for Turmoil, while juggling her school work, her new friends, and her changing relationship with handsome band member Marius. Kill the Music is an exciting blend of mystery and romance, with plenty of humour, set in the music world, a mix which will appeal to teen readers. Lorna’s first person narration escorts us into her world, and lets us experience the highs and lows of life with a boy-band, the only family she has. It’s not exactly a normal life, but Lorna is actually a pretty normal girl – she has insecurities, she is good at some things and not so good at others, and she wants to have friends and do normal teenage things. In between catching whoever is after her brother and his band mates. You can read an interview with Nansi about the writing of the book here. The morning it started Mum freaked out about the Christmas tree. It had been thirty degrees most of the night and I wasn’t sure if I’d been asleep for any of it. I could tell from the safety of my bedroom that Mum had woken up foul: heavy footsteps in the kitchen, cupboard doors slammed, the dishwasher drawers yanked out and rammed in again. When I walked into the living room the floors were already baking underneath the sloping glass roof. The air-con remote was in the fruit bowl on the kitchen table. I pressed the button, hoping it would cool Mum down, and kept my distance. It’s been a hot summer in suburban Melbourne and everything around Hannah seems to be melting. Mum is cranky, Dad is distant, Sam is being a jerk. Hannah is about to begin Year 11 and is trying to keep it all together with the help of her friend Chloe and her grandmother Essie. But Chloe’s wild and unpredictable and Essie has a big secret. And then there’s Evan, Chloe’s gorgeous older brother. Everything is changing, certainties are fracturing, uncertainties are everywhere. As summer holidays end, and school begins again, Emily begins to understand who she can rely on. Sometimes the clue to the future is buried in the past. As her world unravels, Hannah explores the threads of her history and why they are relevant to her today. She’s a observer, a quiet soul who has to become a participant. In fact, she has to become the catalyst for change. Her grandmother’s secret is buried deep in her past but it has shaped Essie’s life and that of Hannah’s mother. Now it’s affecting Hannah and her family. There are themes around secrets and the damage they do, family, trust, rites-of-passage. Hannah reassesses her whole life and relationships in moving from child to young adult. Steal My Sunshine is a realistic and engaging novel about a family in crisis and about finding strength and your own way through. Recommended for mid-secondary schoolers. Life is made up of three parts: in THE FIRST THIRD you’re embarrassed by your family; in the second, you make a family of your own; and in the end, you just embarrass the family you’ve made. Yiayia, Billy’s Grandmother, is ill, and she’s decided it’s time to fulfill her bucket list. But she’s stuck in hospital, so it’s up to Billy to do the things she’s asked. He has to fix his little brother – which would be easier of his brother would even speak to him. Then he needs to find his older brother a girlfriend in Sydney – which would be easier if that brother wasn’t gay and happy living in Brisbane. Lastly, he needs to find his mother a new husband – which would be easier if – well, no, it wouldn’t be easy. For whatever reason, it’s Billy’s job to glue his family back together and fulfil Yiayia’s wishes. The first third of his life has to end sometime, whether he likes it or not. 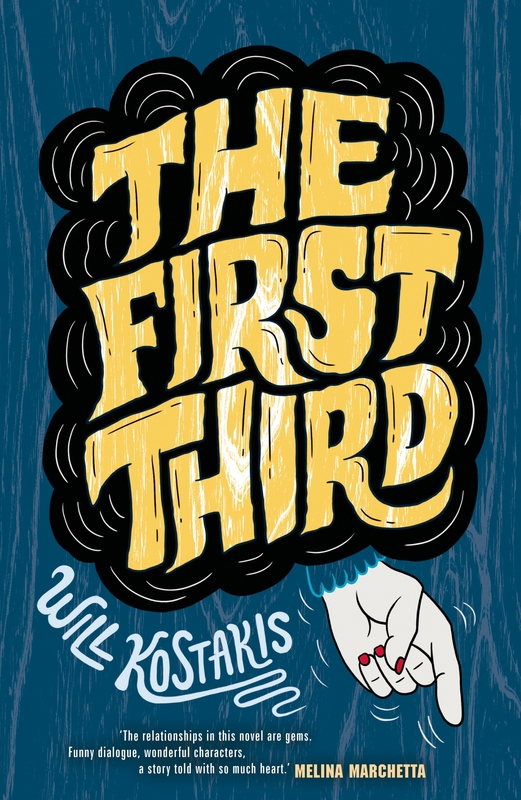 The First Third is a witty yet wise tale of a Greek-Australian family which has plenty of heartache, but is held together by Yiayia, in the last third of life intent on embarrassing everyone as much as she can while she feeds, cossets and loves. The story is a finely balanced blend of humour and heart which will have readers laughing, cheering and crying along with Billy and his family. Excellent contemporary young adult fiction. She made wombats blue and kookaburras pink. But the best magic of all was the magic that made Hush INVISIBLE. For thirty years Possum Magic has been delighted young readers from Australia and around the world. The delightful, magical tale of a possum named Hush whose Grandma makes her invisible to keep her safe, then forgets how to make her visible again is one that is so very Australian and never fails to delight. To celebrate the thirtieth anniversary of its release, Omnibus Books have produced a gorgeous anniversary edition, in hardcover with a slipcase. The red cover is embossed with silver stars, and a front cover picture of Grandma Poss poring over her magic book as Hush sleeps, with a back cover embossed image of Hush reaching for one of the stars. For collectors, this is a beautiful new edition, but for readers of all ages, it’s a sturdy, long-lasting format which is a fitting tribute to one of Australia’s best-loved children’s books. I couldn’t believe it. Was it possible? Could it actually be happening? Were we about to do a study unit on…SOMETHING GOOD? It just didn’t seem right. Last year with Mrs McGurk in Year Four we only ever id units on topics like ‘The Least Interesting Stuff in the Known Universe’. But SUPERHEROES rocked. Superheroes were one of my most favourite-est things in the whole world! I knew heaps of stuff about superheroes! … I was excited. SUPER excited! Eric Vale is excited. The new class theme is Superheroes, and it’s one subject he might actually be able to excel in. But with a killer beast on the loose, a mutant teddy bear out to ruin his reputation, and the dreaded Oogliy-Boogily Man lying in wait at the school fete, Eric might be in for a super fail. Eric Vale: Super Male is the second on the funny Eric Vale series from award winning author and funnyman Michael Gerard Bauer. Eric is a good kid who gets himself into lots of silly scrapes, mainly through his daydreaming and over active imagination, and young readers will relate to many of his insecurities. The text is complemented by cartoon style illustrations by Bauer’s son, Joe. WIth lots of text support from good sized font and the l=illustrations, Eric Vale: Super Male is great for struggling readers, but will equally appeal to readers of all abilities for its humour and story. ‘You can. You have to.’ His handsome features were drawn and taut. Astor took her seat on the upturned box, and stared at the kegs, cans and pots before her. It was impossible. She had never played percussion in her life. But clearly Verrol thought this was their only chance to join the gang. Once she had the hang of the drums, she began to experiment with the timbre of different pots and pans. But there was something missing. 17-yearold Astor isn’t exactly delighted that her step father has arranged a marriage for her, but at least a marriage of convenience offers her a way out of her unhappy home life. The trouble is, it isn’t a marriage she’s been signed up for, but a place as a governess to three obnoxious, unteachable children. Tricked by her stepfather and abandoned by her mother, Astor has no one on her side except for Verrol, the servant assigned to her. She will have to make do until she can figure a way to a better life. Astor has no idea that her life can get worse, but she finds herself fleeing her new home with Verrol, and fighting for survival on the streets, where her music training may be the only thing that keeps her alive. Song of the Slums is a fabulous fantasy novel from the creator of Worldshaker and Liberator. Set in the same alternative Victorian World which will be comfortably familiar to steampunk fans, though billed as ‘gaslight romance’, the story is filled with action, twists and turns, and a plot line which shows that good can triumph. Astor’s growth as a character endears her to the reader, and the supporting cast is strong. Great for fans of steampunk, fantasy and simply great reads. Ella dropped her bag and stared at the poster pinned to the noticeboard. A Midsummer Night’s Dream. Titania. Oberon. Puck. Ella saw a cloud of fairies. A moonlit forest. Filmy dresses with butterfly wings. She sighed. Would she have the courage to audition? Probably not. Her heart pounded at the very thought of it. Ella dreams of being an actor, but when auditions for the school play are advertised, she knows she won’t try out.. It’s impossible to be on stage when you suffer stage fright. Instead, she’ll be part of the stage crew, like she was last year. Still, she wishes it could be different. When the grandfather she’s never met comes back from England and moves in, things start to change. Grandpa is a retired actor, and is keen to encourage Lucy to follow her dreams. Lucy assures him that she doesn’t want to act, but Grandpa seems to see through her. Grandpa is the only change in Lucy’s life. Her best friend Gina seems no longer interested in the same things and there’s a new boy at school who seems conceited, but still seems to be everywhere Ella goes. In the Wings is a moving story of self-discovery, friendship and family. There are several issues explored, but the issues don’t overshadow the story, which will appeal to tween readers. into the sun to jump and play. 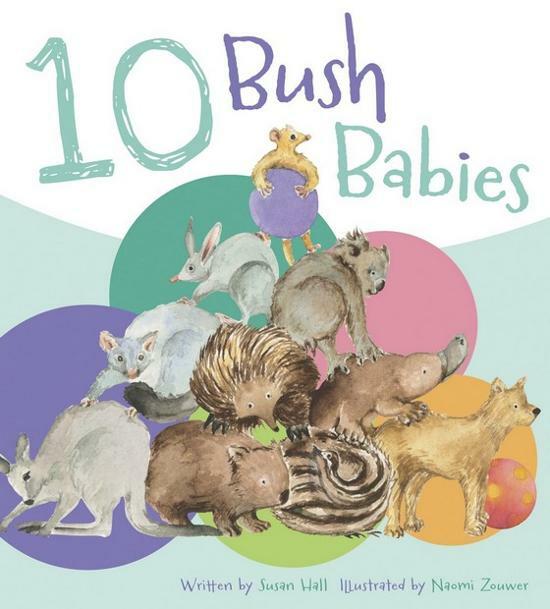 …but only 9 bush babies ran in. Mrs Roo is trying to round her young students up after playtime, but one by one they all disappear. Finally, when none remain, she tries again, and all ten return. Giving an Australian twist to the well-known rhyme ‘Five Little Ducks’, this board book will delight young Aussies, as well as making a cute gift for overseas friends or relatives. The illustrations are inspired by the work of naturalist John Gould, and each new spread features an almost identical illustration, apart from the gradual disappearance of each animal baby, helping youngsters to guess which animal has gone.There is also a hint as to where the baby has gone and, at the end of the book, a double page spread explains where each animal went. So begins a slapstick adventure in which Andy flees from the bee, soon followed by his friend Terry D, and a Tea-Lady. Cross country they god, finally taking refuge in a tree – but still the bee finds them. It is the quick-thinking tea-lady who saves them all. Andy G, Terry D, the Brave Tea-lady and the Evil Bee is a humorous, silly rhyming tale reminiscent of Dr Seuss’s A Fly Went By, but perhaps even sillier. First published as part of Griffiths’ longer book The Cat on the Mat is Flat, this new format features colour illustrations and a larger format, making it suitable for beginning readers. Also available is Ed and Ted and Ted’s Dog Fred.